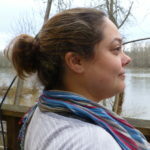 Cheryl has a fantastic office location in South Salem: right next door to her house. She can literally wake up, get ready for work and be there in 10 minutes. Cheryl uses a whole montage of techniques on her clients: ‘a melting pot of everything’ she says. Active isolated stretching and Japanese restorative therapy are two of her favorite modalities to use on clients. She also likes to use cups to get her clients’ muscles ready for massage. Cheryl likes the negative pressure of the cups as they pull the blood to the surface. She finds that using them makes it easier on her hands to give massage because they help release fascia. A special treatment she offers her clients is a 90 minute ‘mini face lift’ using cups. She says the treatment provides a vibrant look to her clients’ faces that’s why she calls it a mini face lift. Cheryl believes the toughest part of being an LMT is keeping yourself emotionally grounded. Yoga and Dao Yin stretching are two ways Cheryl has found to ground herself. She finds breath work helps with her body mechanics awareness, which in turn allows her to continue providing comfort to her clients – just like her grandmother’s LMT.